Walters' first photo. Eventually revealed to be a hoax, but no one cares about that. I’m going to come right out and admit it: I have a weak spot for goofy looking robots. I don’t know what it is, I just can’t resist. So when I came across a sketch of what I can best describe as a mechanical gnome, I felt it to be my duty to let you know. The year was 1987, and I was a mere 6 years old and not yet interested in flying space creatures. Out of the 6,000 people that lived in Gulf Breeze, Florida, a single man was about to get his name in the limelight: a building contractor by the name of Ed Walters. According to Walters, he was burning the midnight oil on the night of 11 November when he became curious as to exactly why there was a glowing blue light in his front yard. The source was behind a pine tree, so he exited his home to get a better look. Much to his surprise, the source of the light was a huge floating spacecraft, shaped like a top, with a number of dark rectangles separated by portholes along the diameter. The glow was coming from a blue ring at the bottom of the craft. Apparently, Mr. Walters is substantially braver than I am, because instead of fleeing he returned to his house, grabbed a camera, came back outside, snapped a number of photographs and decided to get a bit closer. I would have remained passed out in a puddle of my own fear-induced urine. Regardless, the UFO was having none of it. 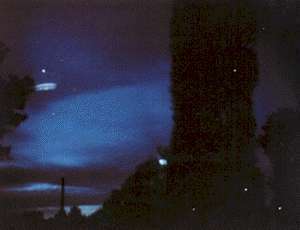 As Walters tried to get some closer photographs, the thing floated over his head and a blue beam shot out of the bottom. Walters heard a voice tell him that he would not be harmed. He didn’t believe the voice, choosing to attempt to scream instead, but the voice told him to calm down. Images began flooding his mind, as though he were engaged in some sort of telepathic slide show, and he apparently blacked out because his next memory is of waking up, the UFO nowhere to be seen. So what was the first thing that Walters decided to do upon gaining consciousness? Perhaps I’m rather a bit of a hypochondriac, but if an over-sized Christmas tree ornament had lifted me into the air with a paralyzing blue beam and crammed words into my head, I’d be en route to the hospital as soon as I could stand up. To make sure all my innards were still where they ought to be, and that I’d not been…probed. Failing this, I’d probably head to the Police, and try and get every anti-aircraft battery in the country trained on the skies above my house. What can I say, I’m the spiteful type. This is again a place where Walters and I show a dissimilarity. The first thing he did was haul himself down to the office of the local newspaper and tell them the story, offering some fantastic photographs as evidence. This was the first step in his one-step trip to fame and fortune. The newspaper gobbled the story up, and for months afterwards local water coolers must have been hearing some very, very strange conversations. The UFO didn’t visit Walters just once. Perhaps they’re sentimental types, but for whatever reason the space aliens paid him numerous visits over the course of the following months and years. The second time he spotted a UFO, Walters claimed that he could hear a humming sound, as though two people were having a quiet conversation nearby and he was just far away enough to be unable to distinguish words. Looking up, he saw a sparkling star that soon fell to earth and was revealed to be a space ship. With the reflexes of an old west gun fighter, he took a photo of the thing. Apparently, the space aliens, with all their advanced technology, decided to send one of their guys disguised as a Knight of the Round Table to peep into Walters’ bedroom. It was about 4 feet tall, and encased in metal plates. Unable to distinguish between the hand and fingers on the thing, Walters was able to see a pair of all-black, terrifying eyes behind a clear visor-like section of his helmet. His sketch has an outline of what he suspected the head to really look like; it is the light-bulb shape a la the Andreasson abduction. The creature also held a long, thin silver rod in its hand. For purposes of both brevity and comedy, the creature shall henceforth be referred to as the Breezebot. 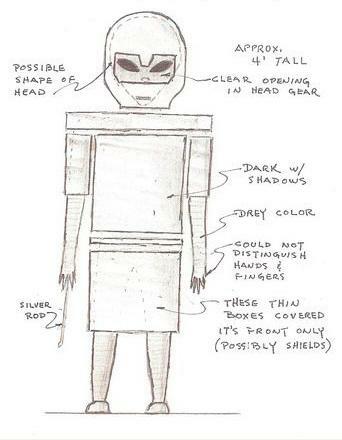 But the name Breezebot may not be entirely accurate; a notation on the side of the sketch says “The thin boxes covered it’s (sic) front only (possibly shields. )” The point is, the name “Space Galahad” lacks a certain flair. Back to the story. The creature looked at him for a moment, turned, and sauntered off. Walters, once again displaying nerves of steel, gave chase to the creature, but as soon as he left the safety of his back porch, was once again struck by the blue beam that immobilized him until the creature was safely away. In a field near his house, he saw a second blue beam descend, which he suspected was the UFO retrieving the interrupted Breezebot. 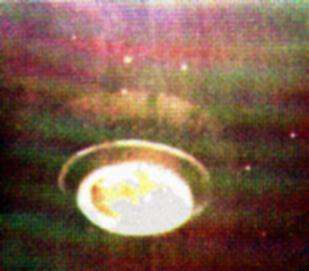 As soon as the beam dissipated, Walters retrieved his camera and duly photographed the departing spaceship. Three days later, men from beyond the stars were again at work in Walter’s neighborhood. A ship, which he of course photographed, came to a stop either just above the ground or actually landed. It left behind a cone-shaped impression that would be a source of great amusement to me personally almost two decades later. But more on that in a bit. Walters' Hoaxmobile, driving down the street. 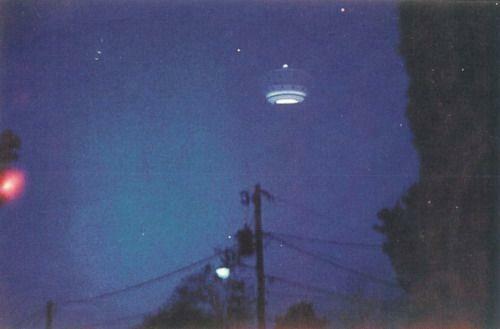 So there’s a gentleman with unshakable nerves and a camera who has indisputable proof of UFOs. Surely, the case is closed and this ushers in a new age for mankind, of greater awareness of our interplanetary brethren? Sadly, no. I’ll be the first to say I wish this were true, but, like most of Shakespeare’s plays, the end is long and messy. Walter Andrus, the head of MUFON, concluded after three years of study that the Gulf Breeze case was one of the most important cases of all time. 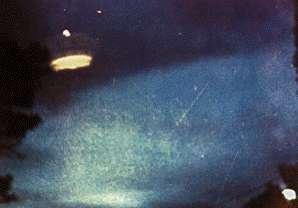 J. Allen Hynek, luminary of the study of UFOs, thought it was all a hoax. Who was right? On one hand, NASA's Dr. Robert Nathan was given copies of the photos to determine whether or not they were genuine. He was unable to reach a conclusion one way or the other. On the other hand, Walters passed two polygraph tests and a psychological examination that indicated no evidence of mental imbalances. That being said, a polygraph test can only test what the subject believes, not what really occurred. The first blood against Walters was drawn by Zan Overall, who discovered that Walter had a little bit more photographic experience than he let on. Specifically, he found that Walters had knowledge of the process of “double-exposing”, wherein two photographs can be overlaid. For instance, a photograph of, say, a model spaceship, could be overlain on a photo of, say, someone’s back yard. This doesn’t necessarily mean that Walters had concocted a hoax; it just means that it is more likely and definitely possible. Such things didn’t seem to matter, however, to the public, whose enthusiasm for the Gulf Breeze case was undaunted. Yeah. The guy who claims he's been visited by UFO space people happens to have models of UFOs in his attic. Hmmm. "I call this one... blurry model at sunset. Breathtaking." Walters’ reaction went through a number of stages. First, he claimed that he’d have been a fool to leave behind such evidence. He said it, not me. Second, he claimed that the model UFO had been planted so as to discredit him. Thirdly, he claimed that yes, the papers in which the UFO had been wrapped were his, but he’d had to chase reporters away from going through his trash, so perhaps someone had pulled some of his garbage out and used it to lend authenticity to the frame-up job. He also said something about someone from the Air Force coming and interviewing him, only it turned out the guy wasn’t really from the Air Force, but he never elaborates on it. But the hits kept coming. Tom Smith Jr., a local teenager, came forward with his own shocking tale. Originally, he said, Walters had taken the photos and given some to Tom, urging Tom to be the one to come forward so as to make the story more believable. Tom wasn’t having any of it, because although he’d have been up for a good practical joke, he was afraid that the larger, more fraud-like actions suggested by Walters would backfire and possibly besmirch his family’s reputation. Proof that space aliens are visiting our world's most ingenious contractors? Feh. I usually believe witnesses, especially witnesses that come forward after the fact, about as far as I can throw them. But Tom brought more to the plate than a tale: he brought hard evidence. 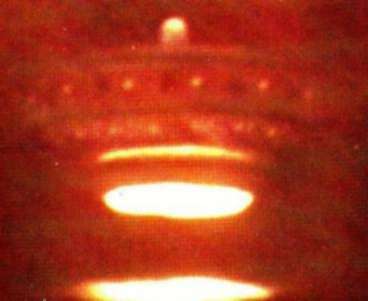 He produced some photographs of a model UFO in the same manner that he claimed Walters used; the results were identical. 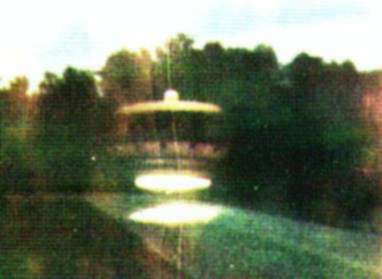 Photographic professionals were unable to say that the photo was a fake, and, if Tom hadn’t shown investigators exactly how to do it, the UFO enthusiasts would probably be claiming that they were, in fact, real, and that Tom was the one misrepresenting the facts. Some many words ago, I mentioned that Walters claimed a UFO had landed near his house and created a conical depression in the earth. Physical evidence? Not quite. Smith showed that, by turning a trampoline upside down and jumping on it, he was able to create a similar impression in the earth. When I read this, and pictured it in my mind, I laughed so hard that first tears, then blood, and finally spinal fluid leaked out of my eyes. That's how hard I laughed. This also explains the strange incident with the Breezebot. Walters took pictures of UFOs every time he saw them, yet he was unable to take a picture of the armored man that showed up at his door. This is very probably because an armored space monster is hard to fake; instead, he took pictures of the much-easier-to-fabricate spaceship. But why would Walters go through so much trouble to create fake spaceman photos? The answer is, as always, for the money. William Morrow, the head of the publishing company that produced Whitley Streiber’s book Communion is said to have paid out a $200,000 advance for a book that Walters was to write. The National Enquirer ran a series on Walters in March 1990, and though the exact numbers remain unclear, I think it’s safe to say that he did not walk away from them empty-pocketed. ABC-TV is also said to have paid out $400,000 for rights to a never produced miniseries. So we know that Walters made at least a cool half million dollars on his investment of time. Adjusting for inflation, I understand that $500,000 in 1990 dollars would be the equivalent of 47 Donald Trumps and a solid gold moon today. And that doesn’t even include the books! Unable to attend the then-annual Gulf Breeze UFO convention, Ed Walters said that he wasn’t interested in preaching to the choir. This is certainly true: he’d just finished writing his third book. Any way you slice it, UFOs are a gold mine. As a note of miscellany, Walters claims some odd things in his book, not the least of which is that he met an alien being that cast no shadow. There’s not really a lot more that can be said. This is a case of dubious evidence being taken as 100% true, and then turning out to be nothing more than a couple of cardboard models and a cunning cameraman that was in it for the money. With a distinct sinking feeling, I must say that I doubt this whole fiasco will cause the UFO enthusiasts to be any more skeptical in the future when faced with a good story and no physical evidence. Oh well.